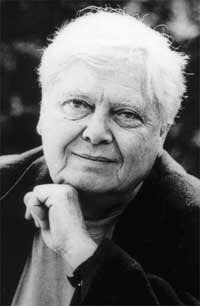 Last week in New York City was William H. Gass week as three encounters with the man and his work sent me sailing, coming to be a little more in love with words and the people who love them. 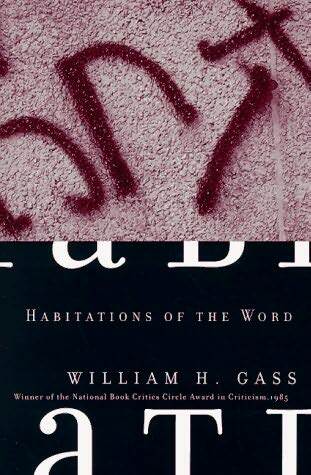 As word wars are rampant, as speech clutters and cuts, creating human happiness and pain, I feel a duty to point people toward Gass’s essay “The Soul Inside the Sentence” from his book Habitations of the Word. It is a startling read touching on what words do, how they are created, who creates them, how the minds and egos of those creators edit and embellish them, and whether when printed they are used wisely, artistically or atrociously. Gass, a fiction writer as well as an essayist, but more completely defined as a philologist and a philosopher of language, works his own artistic and poetic designs into his language no matter the format. For instance, in On Being Blue, his feverish spate of language described words and consciousness using the concept of the color blue as his main theme. This work resembles a treatise but treatise as a book-long poem. It’s a paragraph I’ve read a half dozen times (and now typed out)—read to be happy, re-read to smile, delighted in the “w’s” that start the first five sentences and recur throughout, the “they’s” at the end. It is Gass celebrating the power and the tyranny of language, what it does and how it changes our lives. In writing about the soul in the sentence he populates the early pages of the essay with examples of Baroque prose, highly ornate language from the 17th Century, with examples from exemplars Sir Thomas Browne and Ben Jonson. These titans are employed as a segue to examining what it means to write, to create and caress a sentence into a presence—a being who casts such a convincing energy it can’t be ignored. It is no secret that many write out of loneliness and frustration. Gass endorses holding onto that anger, holding up Henry James and Rilke, among others, as those constantly inquiring, hammering away and parsing their peccadilloes to keep themselves young and hungry—fighting and finding their form into their last days. A few days before reading the essay I reread his short story “Mrs. Mean” in the collection In the Heart of the Heart of the Country. The tale begins innocently enough as an unnamed narrator observes his neighborhood and neighbors from his front porch in a small Midwestern town. He describes their foibles and peoples their pulses with his own judgments: “I sail my boats on their seas. I rest my stories on their backs.” ; “I take their souls away—I know it—and I play with them; I puppet them up to something.” He is a magician, but a mean one and so he gives a woman whose name he doesn’t know a mean name—Mrs. Mean. But she eludes him. He can’t contain her, can’t explain away her overbearing, her swearing at and hitting her three young children (angels by no means) or a sullen and silent husband. Is she as bad as the narrator says? Is she the mirror for the meanness that is him? And then he said that there were moles upon her body, on her thigh. The thigh, I exclaimed, the home of beauty. The right side or the left? The left. The left! Momentous conditions are being satisfied. Are they low upon it? high? Near the hip. The hip! Glorious! Were there two? Two. Two! And the color: brown? red? black? Yellow. Yellow! What a marvel! And the hair that grew there? The color of the hair that grew there? Surely there was hair. There must be. My friend, you must look again. Look again. Again. Determine it precisely. So he sounded with the bait. He was hooked through his throat to the tail. “Mrs. Mean” stayed with me. Though a re-read, parts were still muddy to my untrained mind, but surely lasting with language. Travailing myself with form, Gass had shown me a new way into the house. Let the narrator fester, let him shove his misery off and try to implicate everyone else as tyrants when of course the master puppeteer was the meanie-poo. The day after reading “Mrs. Mean” the seminal event in my week of Gass conjunctions occurred. He was in town to introduce an award from the National Book Critics Circle given to his beloved press, Dalkey Archive. I knew I’d at least see the master on stage. But the day before the ceremony my friend John Madera called to let me know he’d just seen Gass at the infamous Strand bookstore. Luckily I was about a mile away. Sitting in a café, I fumbled to pay my check and ran across town with a backpack full of books. I was introduced and we made our way to the basement to help Mr. Gass and his wife find books on Elizabeth Bishop as research for an article he would be writing about the newly released book of correspondence between Bishop and the New Yorker. Being in the B’s, Gass thumbed through a book by Borges that didn’t seem to number in the 20,000 he owns—Seven Nights, released by New Directions. Soon added to his cache, I told him I had just reread “Mrs. Mean.” He’d written it over fifty years ago, 1957 to be exact. One of five stories making up a book which remains his most popular today. Though the earliest story was begun in 1951, the book didn’t come out until 1968. He told me publishers turned him down for ten years; he couldn’t get anything in print. Hearing this from a man whom others and myself consider the greatest living American writer can only embolden one to press on and to be born somewhere in the middle of our first book, as Gass says in the preface to In the Heart of the Heart of the Country. Gass’s speech at the awards the next night, purposefully prepared, was the highlight. He spoke of how Dalkey had taken so many chances, publishing avant-garde work, losing money and how the books he and others had written wallowed in some obscurity, being unread, even by friends. Going through the work of Gass and the work he points one to is its own MFA program, a program with the master Virgiling one into the tradition, into the continuum of words and their power. Greg, thanks so much for this reminder. We still have, among us, this provider of astonishing sentences, sentences that marry the homely Midwestern American to the ornate Euro-philosophic. On top of that, he reads with the best, bringing insight and discernment to imbroglios about which others rant uselessly. I applaud your work here and I envy your encounter. Also, I wonder — is HEART OF THE HEART is bestseller, really? I thought the one that enjoyed the widest readership was ON BEING BLUE. Thank you for reading John. That homely Midwest certainly sticks out for me in “Mrs. Mean” and “In the Heart…” “Icicles” and “Order of Insects” too. I was born there, I wonder if anyone not born there can really pinpoint what is going on. He talks about weather in the stories, in an interview too. How it ravages the landscape and people. Especially winter-icicle time. My single favorite Gass essay: “The Soul Inside the Sentence” from his book Habitations of the Word. Followed closely by “Representation and the War for Reality.” “In Terms of the Toenail,” etc. is another brilliant performance. Thanks Vincent. I’ve had my finger in the “Toenail” essay-man alive. Crazily, I read Under the Volcano about nine years ago, hardly knowing what was going on. I’m glad I traversed those mountain chains. Thanks, indeed, for reminding us & for your eloquent praise–you have some fine lines of your own–of a national treasure.